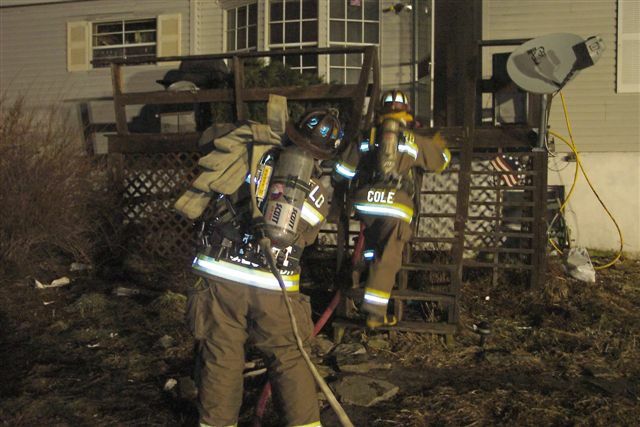 On January 20, at 1858 hours a structure box was transmitted for the working house fire on SR2027. On the assignment: E-18, T-18, L-18, R-18, 18-9, E24, T24, E41. While enroute Suquehanna County advised Chief 18 (T.Turner) that 18PD on scene confirming the working fire. 18 requested the 18S5 RIT assignment bringing E43. Chief 18-2 (O’Rourke) marked on scene with a single story dwelling with smoke showing, fire in quadrant A/D and placed the second alarm assignment on stand-by. E-18 went straight in per command and placed the attack line in service. E-24 laid in and split crews – one laddering the building and one backing up 18. E41 picked up the supply but before establishing the source out of a nearby pond, 18 command held them up due to the knock on the fire. All units went back in in approximately one hour.